The first step in the Sorbet facial treatment will be make-up removal and skin cleansing. Your Therapist will use the Salon Skin 3-in-1 Micellar water onto a cotton pad and gently glide it over your eyes and lips. Once eye make-up is removed, your Therapist will choose a cleanser best suited to your skin. Either the Hydro 3-in-1 Foam Cleanser, Age Affect Cream Cleanser or the Salon skin 3-in-1 Cleansing Oil will be used. Mixed with warm water, the cleanser will be applied to your face, neck and décolleté. Warm, soft sponges will be used to remove the cleanser from your skin. A second cleanse will then take place. Very similar to the first one. A different cleanser may be chosen for the second and final cleanse. The Salon Skin 3-in-1 Micellar Water will then be used to complete the cleanse, close the pores and balance the pH of the skin. It’s now time for the Sorbet Skin Scan! Your Therapist will cover your eyes with cotton wool while she uses the mag lamp to assess your skin. Questions on your lifestyle habits, skin routine at home and skin concerns will be discussed. Your Therapist will tell you everything you need to know about your skin so don’t fear you are in good hands! Exfoliation is the next step. Your Therapist will use the Salon Skin Daily Skin Polish powder. Using a mask brush, the polish powder will be mixed with warm water and foamed up. The foamy mixture will be “painted” onto your skin. You may feel a tingly, yet comforting sensation while the foam works to remove dead skin and clear out blockages. A warm steam will then run over your face to open the pores and prepare your skin for further treatment and deeper penetration of the product. The exfoliator and steam will be removed, leaving your skin feeling clean, fresh and ready for the next step. The next step isn’t always the nicest…. Extractions! A special technique is used to remove any impurities in the skin (blackheads and pimples) to ensure a healthy, clean and happier skin. Salon Skin 3-in-1 Micellar Water is used once again to seal the pores and refresh the skin. The Sorbet Grande facial treatment includes an 18-20 minute facial massage. The massage includes slow rhythmical movements to relax the muscles, sooth the facial nerves and induce deep relaxation. After the facial massage, your Therapist will apply one of the Sorbet Sachet Masks to your face. The Salon Skin Vitamin Rescue Masque will be applied to your neck and décolleté. While the mask is on, your Therapist will offer you a hand, foot or shoulder massage. A treatment called “Galvanic / BT Gear” will be performed. This treatment is all about “pushing the product deeper into the skin”. The effect of the treatment will be product specific. The Sorbet Sachet Mask or any of the Sorbet Serums will be used. The Sorbet Sachet Masque will be removed and the remaining serum will be massaged into your skin. The Vitamin Rescue Masque will be removed with a warm, soft towelling compress. Once the masque has been removed, you Therapist will apply the Age Affect Eye & Lip Repair Serum and the Hydro Skin Lip Therapy to your eyes and lips to plump, nourish and protect. A serum based on your skin concern will be applied – Sorbet Age Affect Power Serum, Sorbet Salon Skin Even Tone Corrector Serum or the Sorbet Salon Skin Breakout Correcting Gel. The Sorbet Age Affect Neck & Décolletage Cream will be applied in slow, soft movements to lift and plump the skin. And there you have it! 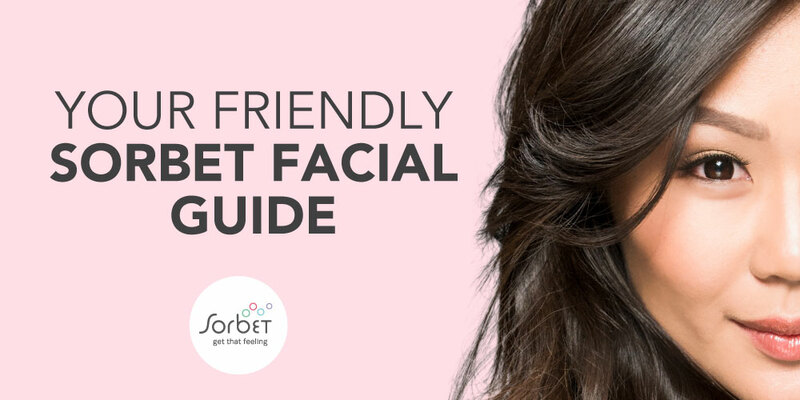 Book your Sorbet Grande or Sorbet Lite facial now! Sorbet skincare professionals know that bright and healthy-looking skin needs moisture. protective barrier to help keep it hydrated and supple. Environmental factors can compromisethis barrier and cause skin dehydration, irritation and premature ageing. Hydro Skin helps to restore this barrier by drawing moisture into the deeper layers of the skin, optimising moisture, improving texture and relieving irritation. Hydro skin is your complete hydration solution for beautiful, glowing skin. Sorbet Skincare Professionals know that nothing treats skin like the delicate fusion between nature & science. Therapists recommend Salon Skin to help treat and restore the specific needs of your individual skin. Sorbet Salon Skin combines Essential Oils (Lemon, Orange & Bergamot), advanced actives (SEPILIFT ™ DPHP) and highly concentrated vitamins (A, C & E) to deliver salon results that will leave your skin feeling renewed and restored. Specialist Product is suitable for skin of all ages.